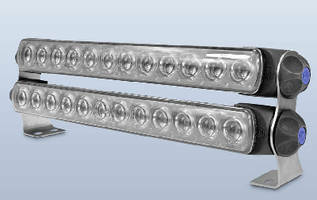 LED Light Bar features aerodynamic, low-profile design. Featuring thermally conductive body, HELLA LED Light Bar 350Â incorporates 12 automotive-grade LEDs that produce 145,000 candela power at 25 W. Housing is injection molded from ceramic-based polymer that is lightweight and resistant to corrosion. Weighing 1.5 lb, hermetically sealed and submersible light bar incorporates Multivolt™ circuit for optimum brightness at input voltages from 9–33 V. Housing features stainless steel brackets that allow flexible positioning. Peachtree City, GA – HELLA, Inc., the North American aftermarket subsidiary of automotive lighting and electronics supplier HELLA, introduces the new HELLA LED Light Bar 350. It features a revolutionary design that combines powerful LED lighting with a sleek, aerodynamic low profile, low weight and thermally conductive, polymer body. HELLA is the first manufacturer to produce a driving light bar with such a body. The HELLA LED Light Bar 350 incorporates 12 durable, high-performance automotive grade LEDs that produce 145,000-candela power at a very low power consumption of just 25W. The HELLA LED Light Bar 350 received the 2016 Global Media Award during the recent 2015 SEMA Show. It was selected by a panel of international judges who reviewed nearly 2,000 products during the show and determined that the Hella LED Light Bar 350 would be of interest in their publications. The housing on the HELLA LED Light Bar 350 is injection molded from a ceramic-based polymer that is highly resistant to corrosion, is extremely lightweight, and protects the LEDs from over heating by excellent thermal management. Weighing only 1.5 lbs., the LED Light Bar 350 is the ideal solution for applications where weight, aerodynamics, profile, and style are a consideration. The hermetically sealed and submersible light bar incorporates a Multivolt™ circuit for optimum brightness at input voltages from 9V to 33V. The housings feature stainless steel brackets that allow flexible positioning to meet a wide range of customer preferences. The HELLA LED Light Bar 350 is available in four beam patterns configurations, including: Driving Beam, Pencil Beam, Wide Beam, and Narrow Beam. The multiple beam configurations allow the LED Light Bar 350 to be used for long range, off-road, truck, ATV, UTV, and SUV applications. The Driving and the Pencil Beam versions are ECE approved, which makes them street legal in Canada and Central and South America (check local requirements). Off-road usage only in the USA for all versions. HELLA also offers a dual light bar bracket, which is suitable for mounting two HELLA LED Light Bar 350s. HELLA, Inc., located in suburban Atlanta, GA, is the North American aftermarket sales and distribution headquarters for HELLA KGaA Hueck & Co. HELLA, Inc. provides world-class aftermarket and special OE support to automotive, marine, and heavy-duty accounts in the U.S., Canada, and the Caribbean. For more information, visit: www.hellausa.com. HELLA KGaA Hueck & Co., Lippstadt: HELLA is a global, family-owned company, listed on the stock exchange, with more than 30,000 employees at 100 locations in more than 35 countries. The HELLA Group develops and manufactures lighting technology and electronic components and systems for the automotive industry and also has one of the largest retail organizations for automotive parts, accessories, diagnostics, and services within Europe. Complete vehicle modules, air-conditioning systems, and vehicle electrical systems are also produced in joint venture companies. With more than 6,000 people working in research and development, HELLA is one of the most important innovation drivers on the market. In addition, with preliminary sales of approx. 5.8 billion euros in fiscal year 2014/2015, the HELLA Group is one of the top 40 automotive parts suppliers in the world and one of the 100 largest German industrial companies. For more information, visit offering www.hella.com.